The Great Pyramid of Giza, an Ancient Wonder of the World, is considered an engineering marvel built as a tomb for the pharaoh Khufu. This largest and oldest of the three pyramids is estimated to be about 140 meters tall and 230 meters in width. A structure that attracts millions of tourists per year also surrounds itself with theories and many unanswered questions regarding its age and architecture. Well, it certainly seems that this secret room has piqued the interest of historians, archeologists, physicists and enthusiasts around the world! So what did cosmic rays have to do with it? Thousands of high-energy radiations are sent to the Earth’s atmosphere from outer space, and one of these is called muons. These are similar to elementary particles like electrons, but much more massive. These heavy, negatively charged muons are not easily absorbed on the way due to their weight, until they are slowed down by obstacles with large masses on Earth. This is potentially what occurred in the case of the Egyptian pyramid too. The cosmic muons passed through an empty space repeatedly, which was detected on a monitor and analyzed over a period of time, resulting in the conclusion that a hollow space indeed existed somewhere in the center of the pyramid’s framework. Plenty more data needs to be collected and at least a few more years of research done to understand the cavity’s function and entire structure. But for now, experts have only guessed this its function. So far it is believed to be about 100 feet long, not even if it is horizontal or inclined or made up of several other structures. The discovery of this cavity in the Egyptian pyramid has been impactful as it also opens up new avenues about the how the building of such a monumental construction, with heavy stones, took place some 4000 years ago. 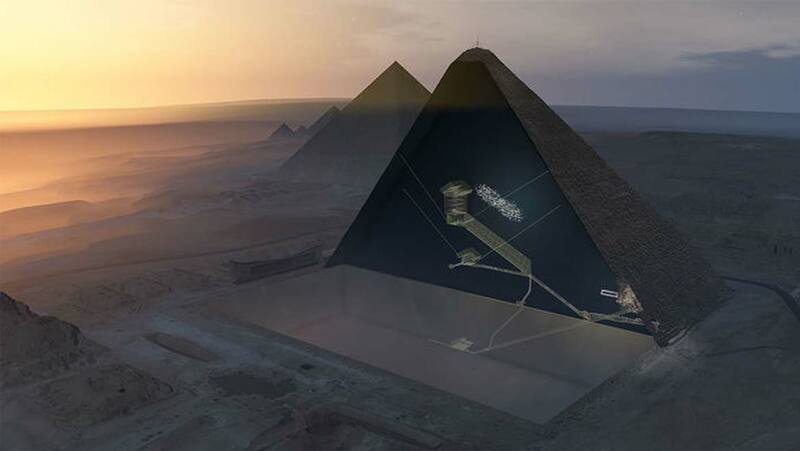 Although experiments using muon imaging were conducted in Giza’s Khafre pyramid since the late 1960s, there was nothing discovered until 2016 when a team led by Kunihiro Morishimo of the Nagoya University measured readings that indicated the presence of an anomaly. After months of research, three, previously unknown, chambers connecting to the grand gallery were found. The study and discovery of this great void, a few days ago, was a part of the ScanPyramids Project, a mission undertaken by the Ministry of Antiquities, Egypt, to explore the insides of the country’s largest pyramids using technology. This is probably just the beginning to entering a world of the unknown. Who knows what lies ahead? But one thing is for certain, it sure is exciting!